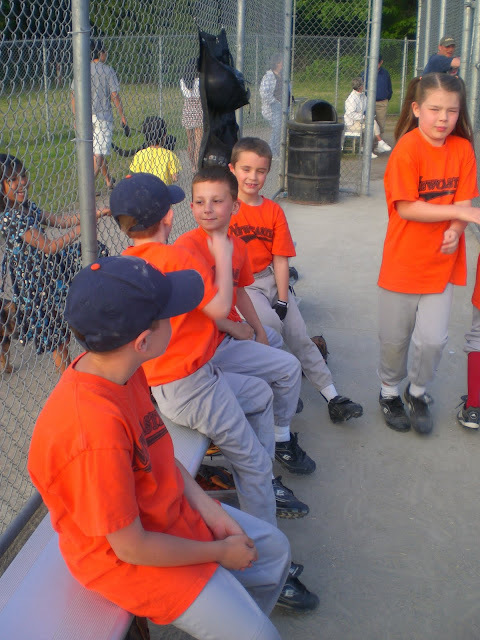 michelle paige blogs: Organize that Dugout! Don't tell my 'baseball lovin' husband and kids that it's NOT my favorite time of year! For the last 2 baseball seasons I've been 'Dugout Mom'. Don't laugh, it's a tough job! Have you ever tried to keep 13 baseball kids sitting still and focused in a narrow little cage with hitting sticks and one uncomfortable bench...in the rain?! (Remember we live in Seattle!) Add on top of that, making sure each kid knows their assigned field position that changes every inning, plus keeping them in their correct batting order, prepared to hit with their own helmet on, batting gloves on and bat in hand! It's hard work! Having the coach yell off positions right before the players run on the field takes time, focused attention, listening skills and kids who actually know where those positions are. Plus, finding out at the last minute who is playing catcher, and frantically trying to suit them up takes time! Whiteboards, magnetic boards, chalkboards and clipboards don't work well in the wind and rain (and sometimes hail) around here--this is Seattle living, people! 1) Take the cards designed for the chart and type out each player's name and each field position. 2) Glue names and field positions to the included cards. 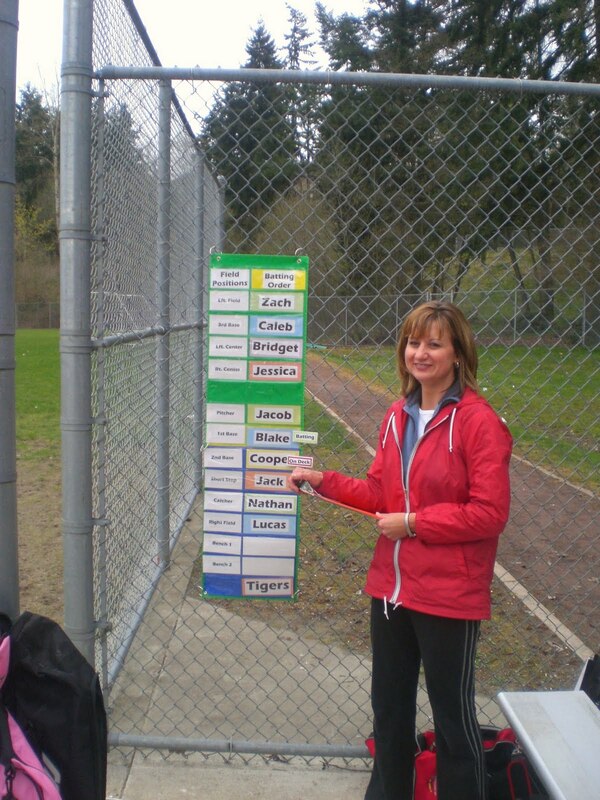 Or glue the names and positions on a color of tag board that matches your team's colors. Pitcher, Catcher, 1st Base, 2nd Base, 3rd Base, Short Stop, Right Field, Left Field, Right Center, Left Center, Bench 1 and Bench 2. 3) Make the column header cards. The right column says Batting Order, the left column says Field Positions. *If you have a 3-column chart, I'd use the far left column for a diagram picture of the field and a star located exactly where that particular position is on the field. 4) Be sure to laminate or cover all cards with clear Con-Tact Brand paper liner. You need these cards to be sturdy and withstand the elements! Place one ring in each hole. 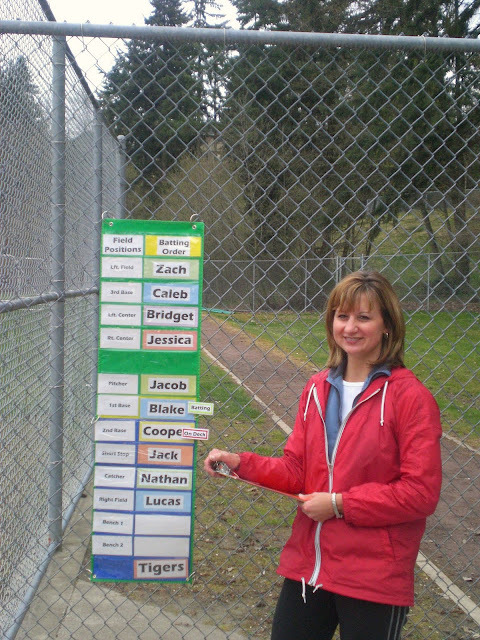 This allows you to hang the chart on a link fence so it won't blow away! You could also use these 2"/5cm Carabiner Clips instead of book rings. The carabiner clips are so helpful when hanging up the player's bat bags as well. Get everything off the ground--is my motto! 7) Make 1 small label that says 'Batting' and another label that says 'On Deck'. Hot glue each one onto a strong plastic clip like these magnetic clips . -Place the players in order starting at the top of the chart moving down. The batting order will stay the same for the entire game. You do not need to move the names once they're set in their batting order. -Get the 1st inning field positions from the coach. Using the field position cards, insert them next to the correct player. -When the team is batting, use the 'Batting' and 'On Deck' clips to show who is up to bat. Move clips down after each player hits. -Each time the team goes out to their field positions, quickly rearrange the field position cards for the next inning. This allows the players to know exactly where they'll be playing next time, without having to ask! 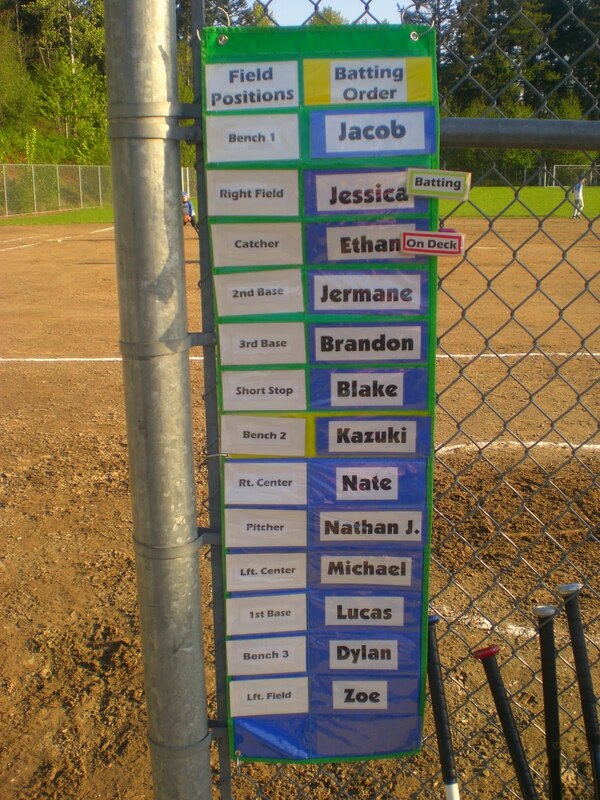 -Dugout Moms like the chart because it keeps order. -Coaches like the chart because it saves time, it really does!-Players like the chart because they can answer their own questions. -Parents LOVE the chart...one look and they know if they have time to run to the car to grab an umbrella or a blanket before their child is at bat. 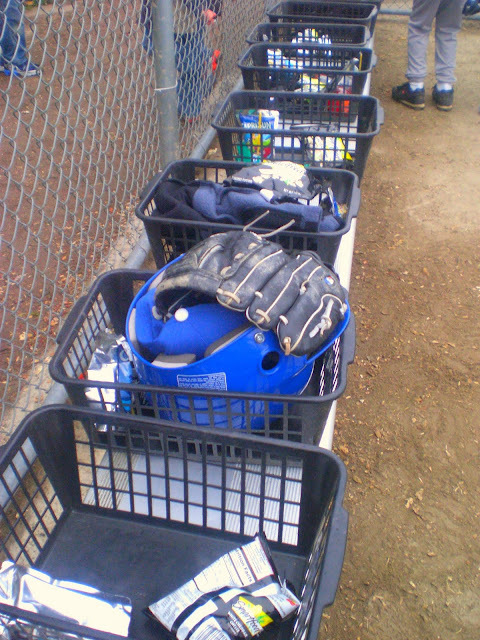 One other tip that I'm sure you dugout moms have already figured out...BINS! Measure how long/deep your bench is by how many players to determine which size of bin will fit. Happy Baseball Season! Stay Dry! Here's some more great products to help organize. If your team is a bit older and you're looking for a more 'mature' system, take a look at these products. 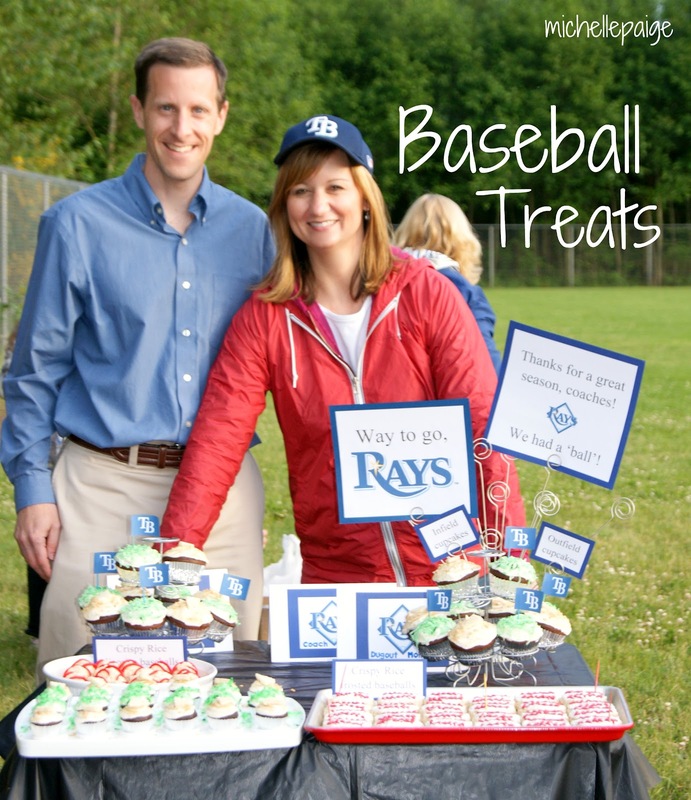 Need some ideas for the end-of-the-season celebration? Click here! Take a look at our Father's Day Baseball Celebration, too. 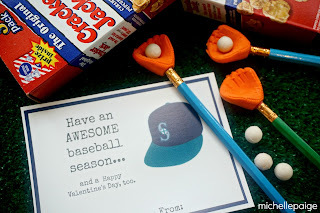 Need some baseball printable valentines? Click here. be able to bless him with these ideas. Glad I could help, Stephanie! Thanks for your comment and have a great season! I was team mom for many years throughout my son's baseball career. I only wish I had this idea a long time ago. I think it's a very creative and organized way of keeping things running smoothly. And you're right, being a team mom is alot of work and i loved every minute of it. Wish I could go back in time and do it again. I'm gonna pass it along for all moms with little ones. Thanks for all your great ideas! We had our first T-Ball game on Saturday, and everyone was impressed with how well your suggestions worked! You are a genius! Wow! So glad everything worked well! Thanks for your comment! Where can u find that organiZer. . I'll be using the 3 column one you suggested and already my Coach is excited!! So glad you found an organizer. Have a great season. Playball! 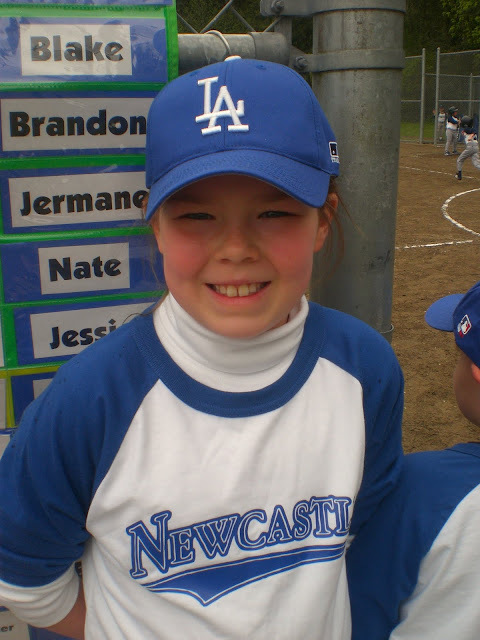 I will be the Dugout Mom this year for my Daughter's Softball Team. This is a GREAT idea and I'm glad you shared it with me. Usually I just sit and enjoy the little girls, but organization is much needed!!! So I stepped up and hopefully it goes well with your help. I'm sure it will go well! A little organization goes a long way in the dugout. Have a great season! I KNEW I would find a way to organize the chaos in the dugout by searching Google! This is PERFECT! Thank you so much!